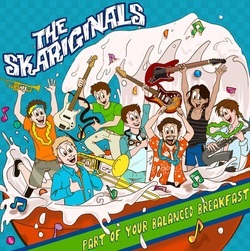 "Part of Your Balanced Breakfast" is out now! Welcome to our new website! We're so glad you've taken the first step to become our friend! Feel free to navigate through our music, show dates, lyrics, bios, and more to learn more about our band. The EP is out now! Check out "Part of Your Balanced Breakfast" on any major platform (iTunes, Bandcamp, Soundcloud, Spotify, etc. ), and pick up a sweet physical copy at our next show!